As we pause to consider the start of the new year, and the opportunity to grow in different areas of our lives – such as health, intellect, relationships – let’s not neglect to give attention to the most important area of our life: our spiritual condition. This condition, the state of our soul, must be given life and nurtured because it reflects the quality of our relationship with our Maker, and determines our posture toward life and its inevitable trials. “To every one who is in downright earnest about his soul, and hungers and thirsts after spiritual life, the question ought to come home with searching power. Do we make progress in our religion? Do we grow? “The question is one that is always useful, but especially so at certain seasons. A Saturday night, a communion Sunday, the return of a birthday, the end of a year – all these are seasons that ought to set us thinking, and make us look within. Time is fast flying. Life is fast ebbing away” (99). When’s the last time you thought about the “passive graces”? If you’re anything like me, never, because you’ve never heard of the passive graces, and probably wouldn’t have, if you didn’t read someone like J.C. Ryle, the famous nineteenth-century bishop of Liverpool in the Church of England. 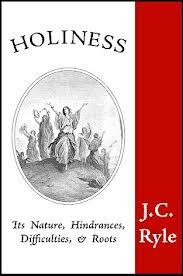 In his classic 1877 book, Holiness (Charles Nolan, 2001), in the chapter on sanctification – the life-long process of becoming more like Christ – he writes about the need to give our attention to growing in the passive graces. Ryle further comments: “The passive graces are no doubt harder to attain than the active ones, but they are precisely the graces which have the greatest influence on the world. Of one thing I feel very sure – it is nonsense to pretend to sanctification unless we follow after the meekness, gentleness, long-suffering, and forgivingness of which the Bible makes so much” (35).